I was 16 years old when I had an experience that solidified my certainty that God knew exactly who I was. I had always known who He was, but this experience took our relationship one step further. I knew Him… and He knew me. It’s a personal experience, one too personal to share in such a public forum, but it was real and good and validating and has stayed with me as a defining moment in my life, even 15 years later. I was prepared for such an experience because from the earliest days of my childhood I was taught about who God was. I was taught to recognize Him in the beauty of the world around me, in the love that I felt in my home, in the joy and happiness that I found in playing outside or snuggling inside. I was taught to recognize that God is everywhere, that God is love. As a child, I was never told that if I did not believe a certain way, I was going to hell. I was never told that my friends who didn’t believe as I do were going to hell. I was never told that those who make different choices than I do, who live different lifestyles than I do were going to hell either. I was taught to be tolerant, to be kind, to be compassionate and forgiving. I acknowledge that there is a brand of toxic Christianity that exists, that judges and belittles and demeans. 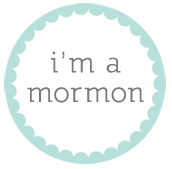 I am a Mormon that grew up in the Southern United States. I have experienced such discrimination first hand. In high school, I had a boy tell me he didn’t want to date me anymore because his preacher told him I was going to hell for being Mormon. Notes were regularly left in my locker, inviting me to be saved, informing me that prayer meetings were being held on my behalf. Such gestures were particularly frustrating because I considered myself a person with a strong sense of who Jesus was and what role He played in my life. I won’t try and tell anyone that all Christians, or all people of faith in general are perfect, but I will assert that to paint us all with one big brush–to push us all into a box of intolerant narrowmindedness, to imply that we are all scaring our children into following our footsteps with tales of fire and brimstone simply isn’t fair. When my husband and I teach our children about God, we teach them that they have a right, even an obligation to study and pray and ponder so that they may learn for themselves. Of course, there is a level of blind obedience that exists with young children. But ultimately, each of my children will reach an age where they will have to decide for themselves what they believe. I guarantee when that day comes, they won’t have a mother standing over their head threatening damnation if they happen to choose a different path. The thing is, I feel this way not in spite of my faith in God, but because of it. Because the God that I know is good and gracious and kind and loves us all. And that’s what my children are taught in church. Early this morning, all I wanted to do was cry. Morning sickness was knocking me flat – I’d already thrown up twice, and it wasn’t yet 9 AM. Henry and I had to be at preschool in an hour, Ivy was awake in her crib, calling over and over for me to get her up, and I hardly had the strength to pick myself up off the bathroom floor. “Heaven help me,” I said, in utter exasperation. And then, it occurred to me… heaven help me. I pulled myself to my knees and said a quick prayer, pleading with the Lord to give me the strength that I lacked. We need not ever mother alone. When we are stressed, our nerves and patience wearing thin, God is there, ready and willing to fill in the gaps. He knows what our children need – what love and tenderness they deserve and he will help us when we feel we are falling short. He will loan us the love that is required. We need only ask. Sure enough, on a fateful Tuesday afternoon, I missed the cards and mistakenly sent them through the wash. By the time his jeans came out of the dryer, his stack of Pokemon cards was a wilted pile of frayed edges and blurred pictures. I sighed. It was another two hours before Sam would be home from school, but the lecture started building in my mind right there on the spot. I knew he would blame me – would be upset that I had ruined his cards. And buddy, let me tell you, I was going to share a piece of my mind when he started pointing fingers at me. Because the cards belonged to him and he forgot to get them out of his pocket and it is not my responsibility and on, and on it went. I swallowed my lecturing words and took Sam upstairs where we ironed and trimmed his cards, salvaging what we could. But it wasn’t me. I was the lecture, the I told you so and you should have known better. But God knew that Sam’s ruined cards were lesson enough and what he needed was an outpouring of love. And so He loaned me a little to get me through. Mothering is hard, gritty, emotionally draining work. So much is expected of us and our reserves of energy and strength can be depleted so quickly. But heaven help us, we don’t have to manage alone. The raising of children is a holy work – a divinely appointed responsibility that is well worth the attention of our Father in Heaven. Ask. Ask with an open heart and let Him loan you the love that you need. Today, I borrow my Mother’s story – thoughts shared from mother to daughter that touched and inspired and left me thinking about the kind of person I want to be. Not on paper or in lofty conversation, but in deed, in the actual going and doing of my everyday life. She was working on a baby quilt – a project that needed to be finished and somehow kept falling to the bottom of her priority list. Other things, necessary things, worthy things kept climbing to the top, demanding her time, her efforts, her energy. Finally, an afternoon was available, so she pulled out the quilt and started to work. And then, the phone rang. And then she stopped. The words flooded into her heart and mind with such clarity, she knew they came directly from God. I’m here, Lord. Use me, mold me, take me as an instrument in Your hands. And He would! Oh, how he would long to have us all standing ready, willing, open to His promptings if we could just shake off the shackles of distraction, of pride, of thinking that we really know what is best for us and for others all on our own without His help. A few weeks ago, I was discussing a scripture from the Doctrine and Covenants with my seminary students. Five souls – Jordan, Sam, Lucy, Henry, Ivy. For me, this scripture has always been about missionary work – about preaching the Gospel of Jesus Christ to those without. But is there a greater missionary effort than that which goes on in the walls of my own home? Is there greater joy than what comes from teaching your children to love the Lord? This mothering work that I do is so much more than maintenance and cleaning and work, work, work. See, serving your children IS serving God. A clean kitchen, a cooked meal, a wiped face, a skinned knee kissed. Think of them as chores, as obligations… well, there isn’t any joy in that. But think of them as offerings, and there, there is the joy. Thanks for the lesson, Mom. I’m not there yet, but I’m closer because I have you to follow.